FAQs on asbestos paper on air ducts. This article series describes the difference between asbestos paper wrap or duct seal, asbestos pipe insulation, and hardcast asbestos lagging or plaster used on boilers and pipe joints. We discuss the PACM designation for asbestos materials and we offer general advice for options in handling asbestos paper duct seal and wrap. These questions & answers on asbestos found on heating and air conditioning ducts were posted originally at ASBESTOS PAPER DUCT INSULATION - be sure to review that article. (Feb 1, 2019) James said: what do I do about asbestos paper on this air box? Reader follow-up to question and answer below, discussing handling of a warm air supply register box whose exterior was wrapped in asbestos paper. Here the photo I can do best without removing grille as they forced to fit in the grille and sealed with caulk. Quick question: if I just want to abate this ductwork boot, will that cost similar as much bigger work as they still have setup for the entire room, etc? Usually the safest step is to leave the item in place, encapsulating with a suitable paint. When asbestos paper is on the exterior of a supply register or box the interior of the box is under positive pressure when the heat or A/C is on - so even a small air leak would be trying to blow out, not in, so not trying to draw asbestos particles from the paper into the air supply. From the ceiling below, remove the grille and inspect the interior of the box; if you see all sheet metal and no asbestos material then there's no asbestos paper in that air path. Attach a photo of what you see and I can comment further. I don't see any paper or other insulation or tape inside the box in your photo. Check that to satisfy yourself. Fair question to ask the remediator - if it can be disconnected and removed intact in one piece the remediation may be quite easy and inexpensive. If they have to rip things apart - and if you look like a litigious sort or are an attorney - the price will go up. Watch out: keep in mind that if you see asbestos material in one place it may well be in others - we don't want to have to keep repeating the job. It certainly looks like it from here, James. It was common for a duct "Replacement" job to leave the old register boxes in place as that makes the job quick, easy, and profitable, avoiding having to disturb ceilings and walls to remove and replace the distribution boxes supplying the actual air registers. Recently replaced ac/furnace and duct system. They did not replace vent. The house was built in 30s. Although duct system has been replaced before, this vent does not seem be replaced. Is it wrapped by asbestos paper? 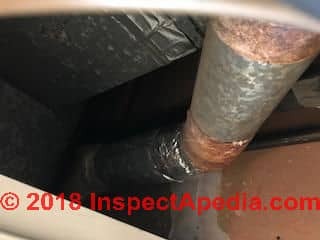 On 2019-01-24 by (mod) - asbestos-suspect duct tape or duct wrap exposed at duct interior? Can someone please tell us if this looks like some asbestos tape or some harmless insulation backing peeking from at the outside of the metal ducts we have into the inside of these metal ducts? We found this when the register grille was taken down for painting the room. The metal ducts are all enclosed in the dropped ceilings except for in the furnace closet where some asbestos tape was found on the furnace to plenum connection under some later added regular duct tape. The tape there is also intact, but is being abated. The house was built in 1970. Visually, the material seems intact - not fraying or peeling apart. It is definitely bit yellower than the tape on the furnace. Therefore wondering if it could be the Two Part Duct Sealing tape that Hardcast sells and was selling in 1970? Is this a hazard to leave it in such a location peeking into the duct? Have we been inhaling asbestos for the last several years? Very worried. Also, if it is asbestos, what is the best way to seal or encase it, if any? Use the HVAC mastic tape + mastic at the joint that is right ahead of this material without touching this material so this material is sort of sealed in again? Or do all the ducts need to change - this is huge work as the ducts are all inside dropped ceilings and drywalls - so a lot of demo. Here is another image of the same duct. I see what looks like a heating air supply register that is filled with dirt and debris. Possibly also some building insulation. It would make sense to have the duct system inspected and if it's all metal as I see in your photo, professionally cleaned. No one can assert the presence or absence of asbestos from your photo. I lifted up the heat duct and found this! Does it look like asbestos? I have 5 kids in my house opinion please! It is the in floor heating in our basement. The house was built in 1974. We just had the heater replaced 6 months ago. Not sure if they looked at the vents. From the photographs that looks like an asbestos paper on your heating ducts. We recently became aware some of the furnace plenum & duct insulation in the house we are renting may be asbestos. Is it possible to tell from this picture if it's likely asbestos? There are a few damaged/exposed areas (a corner on the plenum, and an area next to the furnace where the corrugated material has been cut). House is in CA, built in the 1960s. Furnace seems to have been replaced sometime in the 90s. Here's a follow-up picture to my previous comment with a close-up of where the corrugated material has been cut / is damaged. Any opinions about whether this warrants concern would be appreciated. On 2018-11-13 y (mod) - brown paper duct wrap: asbestos? Regrets, Ed but I'm not sure what sort of paper duct wrap is shown in your photo. To know for sure what you've got you'd want to have a sample tested by an asbestos test lab. Inside a bulkhead is a short segment of duct wrapped in brown paper which is torn about 1/2 way along. There's also some dark brown adhesive on the duct and part of the paper. Any idea what it might be? That looks to me like a bit of asbestos-based paper used as part of an HVAC duct connector or joint. It appears to be on the exterior of an air supply duct (as I see a duct damper lever). Duct supply air wants to blow out rather than draw into the duct at any joints or leak points. In my OPINION that means it's not likely that the inch or so of asbestos-paper that we can see is producing a detectable level of asbestos in the building's air sent through the supply duct. Asbestos paper or other asbestos products that are actually exposed in the air path are something that I'd want removed; usually the least costly approach is to simply remove the duct materials intact and un-disturbed and to install new ductwork. On 2018-10-24 by Andrew Should I be concerned? What is this product? The professional home inspector made no mention of this in his report. It is in plain view. Should I be concerned? We have a house built in 1936. It appears to have asbestos wrapping the duct work and probably in the flooring. This is all in good shape and has not been disturbed. I would like to get the duct work cleaned out. Do you have any methods that would work for this without disturbing the asbestos? Bobby, the photos are a bit small and not so sharp but we could be looking at an asbestos paper or fabric duct insulation that has been wet or stained by rusty water. Here are the other 2 pictures we took of the flue. Is this asbestos? We think the furnace was manufactured in 1985, so how would asbestos have been used in the flue (did asbestos not get banned in 1977)? Does this flue have asbestos paper? Also the boot - is that asbestos as well? The paper seems to be fraying in some places - do we need to do an immediate remediation on it? If this is asbestos, we were hoping to change the furnace next year and do the abatement at the same time. Also, one more question if you don't mind: how do we find out if our ducts (that are behind dropped ceiling covered with drywall) have asbestos in them (insulation or sealing)? Yes that is asbestos - corrugated asbestos paper is rather definitive in its appearance. It would be helpful to know the country and city and age of the home where your corrugated asbestos paper wrapped ductwork is installed. Does this look like asbestos? I cannot tell if it appears to be damaged/hazardous or not. Well It sure looks like it, Allen , by color, appearance, and location. On 2018-03-27 by Anonymous - ok to keep ducts after asbestos was removed? On 2018-03-27 1 by L.D. Questions - If you have the asbestos wrapping removed from your ducts do you still have to replace the ducts? 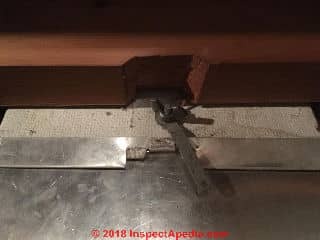 On 2018-02-08 by (mod) - do plumbers handle asbestos encapsulation on heating ducts? No, Carol not a plumber. Depending on where you live, asbestos abatement is done by licensed contractors. You'd hire a certified, licensed asbestos abatement contractor to remove the old asbestos material and to do what cleanup is needed. You might then use a heating contractor to install the replacement ductwork or some abatement companies also can handle that step. who do you hire to encapsulate it a plumber? thanks for that, they seem to be the foil kind of ducts. Does that make a difference as to whether asbestor or not? 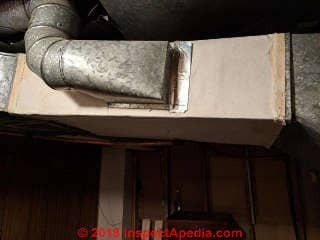 With the understanding that no one can inspect your home for hazards by text, I will suggest that it would be quite unusual for a 1980s home to have asbestos air ducts. I have a home built in 1983/84. We have ducted air conditioning. I think the air con unit itself has since been replaced but not sure about the ducts themselves. Is it safe to continue using the air conditioning throughout the house? In my OPINION paper asbestos on the outside of supply ducts is not likely to move asbestos into the air flow; Paper asbestos wrapping the outside of return air ducts might give up very low traces of asbestos IF it's wrapped over holes in the ductwork, more-so if it's damaged. Ask guy #2 where he saw asbestos; use the page top or bottom CONTACT link to send me photos of what he saw; some asbestos products are so well known and nearly unique in appearance that testing is not needed; else you'd search InspectApedia (use the box above) and collect a small sample to send to an ASBESTOS TEST LAB. I have just been told by an A/C guy that I need to replace all the ducts in my home due to asbestos piping on my heater ducts. The first guy that came in said there was NO asbestos ducts. How can I find out for sure? Do I have to have asbestos removed on old abandoned plumbing! H Man: there is not likely to be a white-gray corrugated looking pipe insulation in an older home that's not asbestos, but it's not common to find that material on metal ductwork. Use the page top or bottom CONTACT link to send us some photos for comment if you like. My house was build in 1965. Is it possible that heating ducks are insulated with asbestos? My home has tin ducting with a corrugated insulator surrounding it. How can I tell if the corrugated wrap is asbestos or not. It depends on where you live. In some areas DIY owner asbestos removal is legal BUT the DISPOSAL of the asbestos waste requires involvement of a licensed asbestos or hazmat disposal service. I don't recommend DIY asbestos abatement - if you don't know how to proceed or if you make a mistake you create significant health hazards and far greater cleanup costs than if the job were done properly the first time. You cannot safely use paper-wrapped air ducts as a wood stove vent - that'd set the building on fire. If you are asking if you can circulate forced hot air through old antique ductwork, that may work, if the ducts are intact, not contaminated on the duct interior, not leaky, adequate in size, routing, location. Is any federal or state regulations to prevent the homeowner to remove the asbestos from their own private home?
. I want to use a wood burner for heat and use this duct work for it. Will they get to hot for the heat or should they be OK? They currently are used for an oil furnace. If you are referring to asbestos paper insulation on the outside of warm air supply ducts, if the paper is un-damaged and not exposed to damage it's not very likely that there would be a release of asbestos fibers into the occupied space air that you could measure. We discuss these worries in the article ASBESTOS PAPER DUCT INSULATION. so I guess my family and I were exposed to asbestos fibres for almost 2 years,would I be correct in assuming this? On 2015-05-24 19:26:48.040400 by Bob M.
What kind of asbestos was used in paper duct wrap in 1908? Was it chrysotile or another form? Continue reading at ASBESTOS PAPER DUCT INSULATION or select a topic from closely-related articles below, or see our complete INDEX to RELATED ARTICLES below. 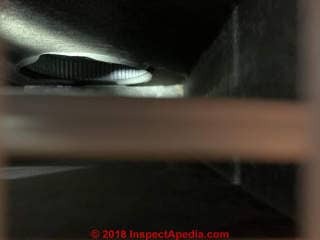 ASBESTOS PAPER DUCT INSULATION FAQs at InspectApedia.com - online encyclopedia of building & environmental inspection, testing, diagnosis, repair, & problem prevention advice.